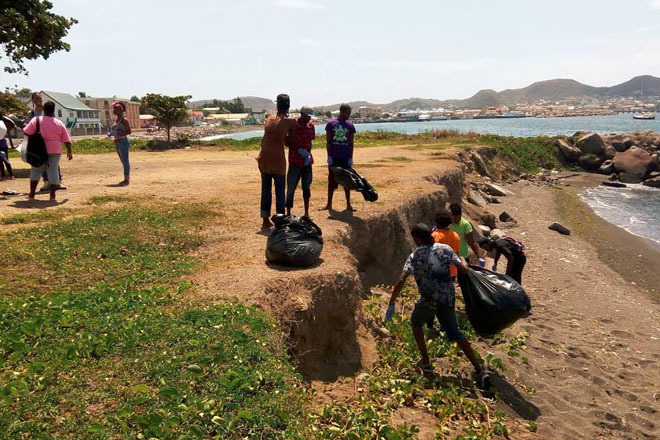 (SKNIS): Prospective group leaders for the Department of Youth Empowerment’s 33rd Annual Summer Residential Camp lived up to the theme: “Team Work Makes the Dream Work” when they spent hours on Saturday (June 18) cleaning up the Bay Front in Basseterre. Trash including plastic bottles, plastic bags, styrofoam containers, tissue paper, old clothes and bed sheets were removed, enough to fill 18 large plastic garbage bags. Youth Officer Sharon Cannonier said the activity was organised to test the ability of the members to follow instructions and be responsible. She said the team worked hard to clean the stretch of land from the Ocean Terrace Inn (O.T.I.) close to the ferry terminal. The experience is likely to be beneficial to persons selected to be group leaders who have to work together during the July 17 to 31 camp to be held at the Beach Allen Primary School. “On camp, the first Friday that they come in, there is a lot of things that they need to do,” Ms. Cannonier said, noting that the entire effort to transform the school into a camp site is a tremendous one. She added that everyone is expected to work with each other to get the job done efficiently. The prospective group leaders also engaged in several training sessions over the past few weeks. These included time management, examining behavioral patterns, and conflict resolution exercises. Ms. Cannonier said that the trainees are aware that some of them will not be selected to be on camp due to the specified number of dorm leaders required. She did however say that the last few weeks with the young people have been enjoyable and the life skills they learnt will aid in their professional and personal development.